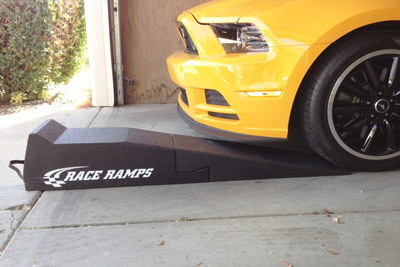 Race Ramps is a manufacturer of premium automotive accessories. Race Ramps is based in Michigan’s beautiful Upper Peninsula, in the city of Escanaba. Race Ramps goal is to provide unparalleled automotive products and second-to-none quality service to automotive enthusiasts all over the U.S. Every product Race Ramps manufactures is made in the USA with American-manufactured raw products. No other car ramps or vehicle ramp solutions can compare. Race Ramps products have consistently won new products awards at every show attended. Race Ramps have been featured in many top rated publications such as Car and Driver, Road and Track, Motor Trend and various other automotive magazines, in their "Top New Products" sections. No other car ramps compare to the Race Ramp products. Race Ramps are practically indestructible while also being extremely lightweight. Because of their unique construction, they will not slide across a garage floor, dig into an asphalt driveway, or scratch or otherwise damage a cement or painted floor. They can be used on grass, sand, or almost any other flat surface, and they will never rust. Most products come complete with straps for easy carrying and storage. Not sure which Race Ramp is perfect for your application? Give us a call – we’re here to help! 1-800-869-3011.